Jefferson County was created in 1827. It was named for Thomas Jefferson, third President of the United States of America, who had died the year before the county's establishment. 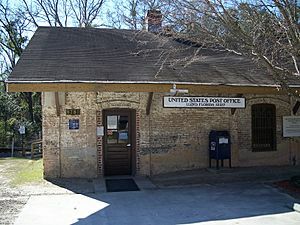 Fort Noel (1839–1842), south of Lamont on the Aucilla River, six miles (10 km) northwest of Fort Pleasant in Taylor County. Also known as Fort Number Three (M). Fort Welaunee (1838), a settlers' fort on the Welaunee Plantation near Wacissa. Fort Gamble (1839–1843) was later established here. According to the U.S. Census Bureau, the county has a total area of 637 square miles (1,650 km2), of which 598 square miles (1,550 km2) is land and 38 square miles (98 km2) (6.0%) is water. As of the census of 2010, there were 14,761 people, 5,646 households, and 3,798 families residing in the county. The population density was 25 people per square mile (8/km²). There were 5,251 housing units at an average density of 9 per square mile (3/km²). The racial makeup of the county was 60.4% White, 36.2% Black or African American, 0.30% Native American, 0.40% Asian, 0.0% Pacific Islander, 1.50% from other races, and 1.30% from two or more races. 3.70% of the population were Hispanic or Latino of any race. There were 5,646 households out of which 26.9% had individuals under the age of 18 living with them, 47.30% were married couples living together, 15.10% had a female householder with no husband present, and 32.70% were non-families. 28.1% of all households were made up of individuals and 10.6% had someone living alone who was 65 years of age or older. The average household size was 2.38 and the average family size was 2.89. In the county, the population was spread out with 18.6% under the age of 18, 8.20% from 18 to 24, 25.0% from 25 to 44, 32.30% from 45 to 64, and 16.5% who were 65 years of age or older. The median age was 44.1 years. For every 100 females there were 109.6 males. For every 100 females age 18 and over, there were 110.00 males age 18 and over. The following income information is from the 2000 census. The median income for a household in the county was $32,998, and the median income for a family was $40,407. Males had a median income of $26,271 versus $25,748 for females. The per capita income for the county was $17,006. About 13.30% of families and 17.10% of the population were below the poverty line, including 21.70% of those under age 18 and 17.00% of those age 65 or over. Jefferson County's library is the R.J. Bailar Public Library, which works with the Wilderness Coast Public Libraries. The sole existing railroad line is a CSX line once owned by the Seaboard Air Line Railroad that was used by Amtrak's Sunset Limited until 2005, when the service was truncated to New Orleans by Hurricane Katrina. No Amtrak trains stopped anywhere in Jefferson County. Interstate 10 is the main west-to-east interstate highway in the county, and serves as the unofficial dividing line between northern and southern Jefferson County. It contains three interchanges within the county; the first being SR 59 in Lloyd (Exit 217), the second at US 19 in Drifton (Exit 225), and the third south of Aucilla at CR 257 (Exit 233). Beyond this point I-10 runs through Madison County. US 19 is the westernmost north-south US highway in the county. It enters from southwestern Madison County as the Georgia-Florida Parkway in a concurrency with US 27, then breaks away from US 27 in Capps to run straight north through Monticello where it encounters a traffic circle with US 90 around the historic Monticello Courthouse. North of the city it runs through the State of Georgia. 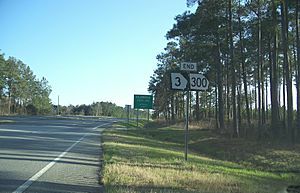 SR 59 is the westernmost north-south highway in Jefferson County and is the only roadway connection between U.S. 90 (at its intersection in Leon County) to the southernmost east-west route through Jefferson County, U.S. Route 98. US 90 was the main west-to-east highway in the county, until it was surpassed by I-10. It enters the county from Leon County twice, the second time from a causeway over the southern end of Lake Miccosukee, and eventually enters Monticello in a traffic circle with US 19. East of the city, it curves southeast through rural Jefferson County, then passes north of Aucilla before crossing the Madison County Line at a bridge over the Aucilla River. US 98 is the southernmost east-west route running through the Conservation Areas of the Gulf of Mexico from Wakulla to Taylor Counties. The sole major intersection is with SR 59. US 221 is the easternmost US highway in the county, running south and north through the northeastern portion of Jefferson County, including Ashville before crossing the Georgia State Line. Jefferson County, Florida Facts for Kids. Kiddle Encyclopedia.